I have recently been working with a local Monmouthshire client who is in the process of building their own house. It took them years to find the right plot and to get the house plans all signed off, but now that the build is finally underway, they’re ready to start thinking about the garden. The plot itself is a really awkward shape but the house to be positioned in the middle of the plot in order to comply with the planning restrictions of the site. What this means is that the front driveway approached the house at a very tricky angle so it’s taken quite a lot of thought to make it an inviting and practical space. 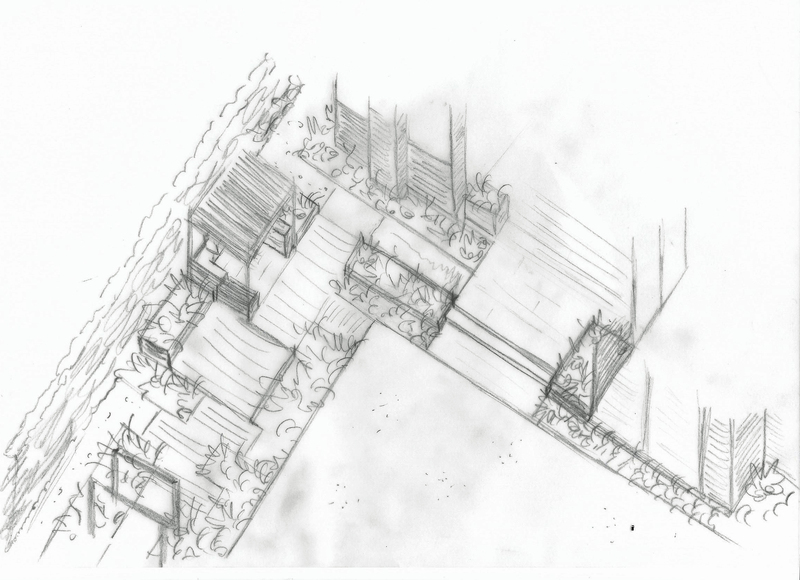 The house will be very contemporary in style and layout so the series of large squares leading up to the house felt more appropriate and made it easier to create a usable and inviting entrance. It also provides space for additional parking. Planting will soften the edges so that it ties in with he main entrance leading to the road. As there is a public footpath running through the land, the defined space adjacent to the house helps to keep walkers on the correct route and gives the house a bit of privacy. The entrance from the road is a shared driveway so this has to remain in the same position and because the plot sits within a conservation area, all the trees in the front garden are protected by a Tree Preservation Order. So the main areas of garden in the front will have a woodland feel. The layout of the back garden is much more straightforward. 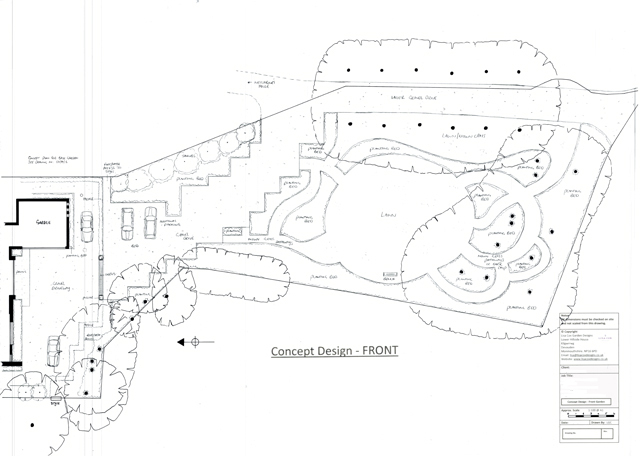 It will have a contemporary feel with large square lawn – a huge space for their children to play. 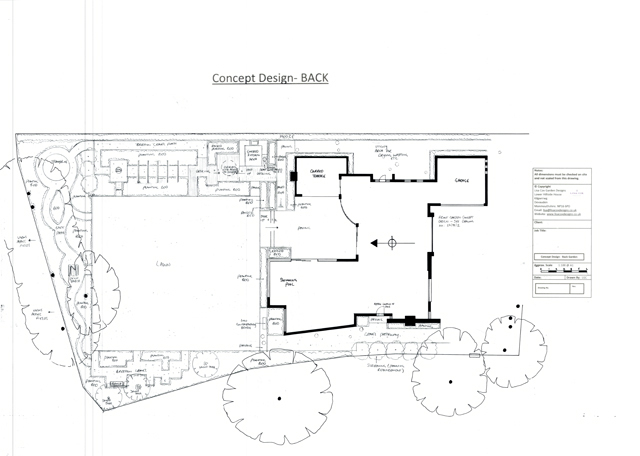 The area near the house will encompass an outdoor kitchen area with a decked walkway under a series of archways. We have positioned the trampoline at the end of the garden so that it can be screened from view, but we plan to open up some small sections of the hedgerow along the end boundary as there are nice views across the fields. 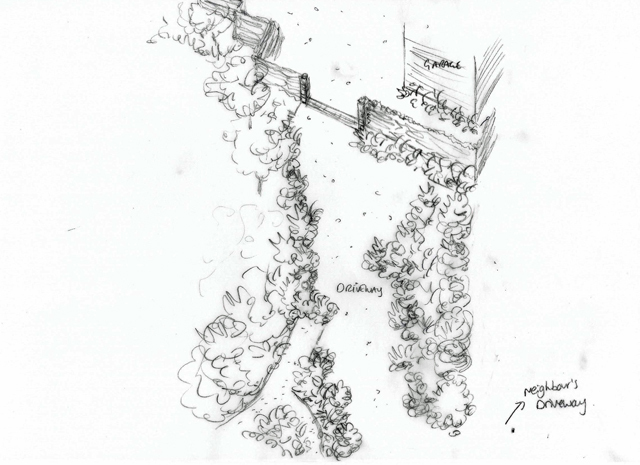 I’m looking forward to producing more detailed drawings for this garden. The house build is some way off finishing but the second floor has already been started so I’m sure it won’t be too long before the framework of the new house is fully on show.